While I was walking one of the trails at La Selva in Costa Rica, I came upon an area that was covered with red-orange flowers. It was an incredible sight as I turned a bend in the trail; like coming upon a field of wildflowers. They heavily covered the trail and extended far into the woods. 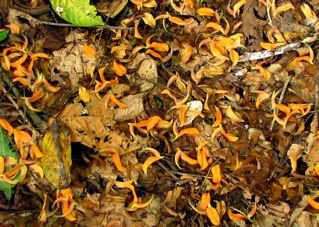 The trees that they came from were bare of leaves, but were covered profusely with these flowers. Later I learned the tree is called poro gigante. It's part of the sandalwood family (Erythrina genus). I love the smell of sandalwood so I understood why I had such an attraction to the flowers, which didn't really have any scent at all. 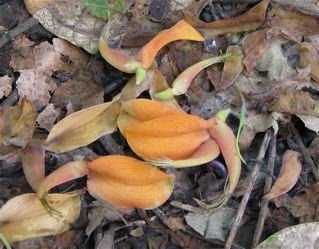 The tree did draw a lot of birds since these flowers are edible to wildlife and humans. When we visited Finca Luna Nueva, we could sit near one of them and watch the incredible Montezuma Oropendolas, various parrots, toucans, aracaris, and other birds fly about the tree eating. Now widely naturalized in Costa Rica from its original distribution from Panama to Bolivia, this tree grows up to 98 feet with this spectacular red-orange bloom mid-February, which was when I was on this trail. It's also used in the central valley of Costa Rica on shade tree coffee plantations. 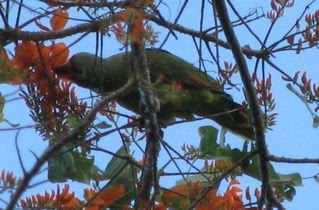 The leaves and flowers are well liked by the iguana but I was always busy watching the birds so I didn't see any on it. As I stood in the midst of this mass wonder of color and flowers I thought about how sad the tree might be to lose all that beauty to the ground, but then I corrected that rather negative thought to think that it must be proud and happy to provide such a colorful woodland portrait for all who came by to see. If the flowers weren't on the ground, you might not ever look up and see the beauty of this tree. I wonder how often we walk by people without seeing their beauty. They're just another person (tree) in the crowd (forest). Every person is unique and has something wonderful to share and sow into our lives. Often we rush through life (the trail) without looking up, only thinking of the destination. Slow down. Look around. There's something beautiful that will drop on your trail if you take time to notice. I would love to walk similar trails in Costa Rica. Who knew that Sandalwood had no fragrance. Hoping to make a trip down soon. We have some friends who stayed at this place called Maquenqe but I don't know about taking our dogs down too. I believe Sandalwood fragrance comes from the bark because I remember the tree is taken out for it. Made my love of the scent lessen for sure. Although it's apparently an easy tree to grow, I'm such a tree hugger it's hard to enjoy something much when I think of the sacrifice. That waterfall looks pretty cool at the place your friends went. The cabins out in the sun would be too hot for me. It get VERY hot in afternoons, especially since this place is in a very hot area of the country. Animals are easier to get into Costa Rica than many countries. There's no quarantines, but you need to have papers from your vet.